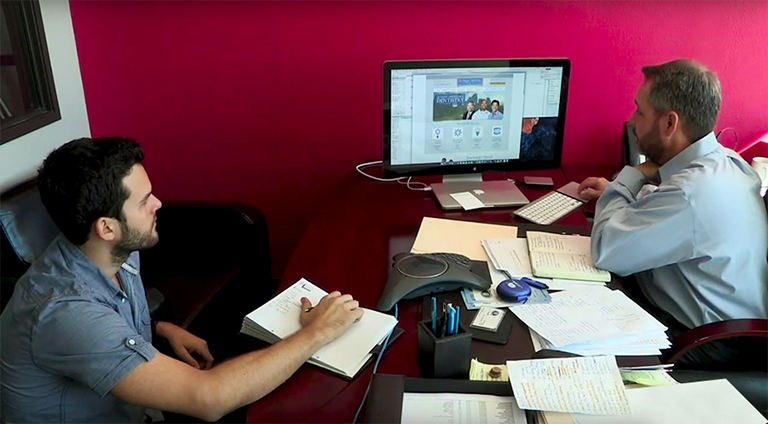 Alex and Tim Kelley, one of TNT’s founders, discussing a new client. When a new dentist signs up to create a website with TNT Dental, Alex’s meticulous nature leads him to thoroughly research each client’s existing website and current marketing approach. By understanding that practice’s present marketing efforts, their geographic area and where they’re coming from, he lays the foundation for the next steps – interviewing. Alex’s research arms him with ideas to discuss with the clients, and creates more productive conversation. This interview allows the dentist to describe themselves and their practice in their own words. 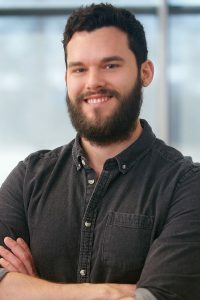 Alex pursues the big takeaway from each interview – three keywords that “describe the feeling of the practice,” which are used throughout the process, and “become the project’s mantra” during the development of the website among all team members. Alex then takes his research and feedback from the interview and works with a dedicated team of project managers, designers, writers and developers to transform each client’s vision into a reality. He creates a wireframe that develops the marketing strategy behind the homepage and highlights creative inspiration for his designer. Alex’s project managers keep SEO in mind by researching the existing website’s rankings on Google. Then, they determine what content can be used on the new site, and create a framework that provides a clear sitemap for Google to read and index. This process then moves on down the “assembly line,” where a content strategy is established based on the team’s understanding of the client’s clinical focus, and the writer begins creating unique content. Focus group participant testing TNT Dental’s websites. It may all sound like a well-oiled machine, but this kind of work doesn’t come without its challenges. Alex understands that sometimes it requires having to put on a different hat in order to see the whole picture. “Being immersed in dental marketing, it’s sometimes hard to remove yourself from what you know and see things through the perspective of the patient or average website visitor,” he says. TNT’s team constantly challenges itself to think of new ways to connect with patients. By thinking outside of the box and embracing continuous improvement, you can execute a strategy that works for both the client and the patients. To take it a step further, Alex and his team understand you have to establish a balance between “cool versus useful.” You can design something aesthetically unique, but if it creates visitor frustration, then it defeats the purpose. Dr. Allan S. Mohr’s website, www.smilecreations4u.com. In finding that balance between creative and practical design, each team member knows the primary mission is to create appealing content for the new or existing patient browsing the website. According to Alex, you can achieve this with custom photos and videos. People are more apt to read words that complement dynamic photos of the dentist, their team, office and their patients. These words must also evoke emotion, something to compel the visitor to pick up the phone and take the next step of scheduling an appointment. If you want to set yourself apart from the competition, get rid of the stock photos and use real images of you and your team. As we’ve mentioned in any of our blogs in the “Video of the Month” series, people want to get to know you. The second and third most-visited pages on a dentist’s website are the “Meet the Dentist” and “Meet the Team” pages. They want to know whom they are coming to visit, and by providing them that human element, they’ll establish a better connection with you. “One of my favorite recent examples of a truly custom dental website that connects with target patients is for Dr. Allan S. Mohr’s practice on Long Island, Smile Creations,” Alex says. “Dr. Mohr is a decorated cosmetic dentist that decided to revamp his website earlier this year and went all in. We helped him capture enough video during a one-day shoot to market his practice online for many years to come, in addition to ample photos,” he added. Alex and his team do their due diligence when creating a website, but they are always on the lookout for what’s trending in the world of website design. 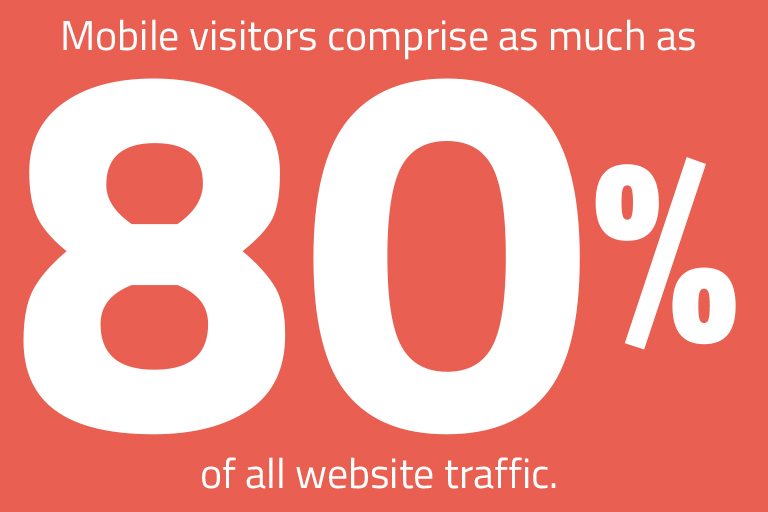 The switch to mobile design has been on the rise (according to TNT, mobile visitor numbers are as high as 80% on the websites they track – nearly double from a few years ago), and in order to remain relevant, practices must ensure their websites allow for easy mobile viewing. The team at TNT designs a site that creates a fluid and predictable experience for the mobile viewer, which is key to converting them from visitor to patient. 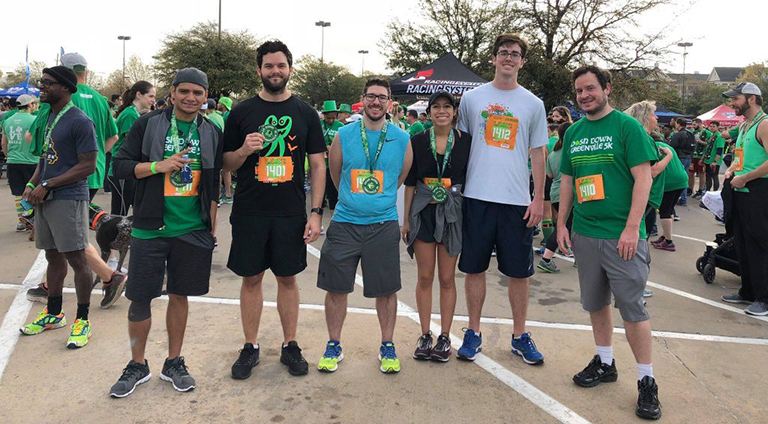 Alex and several of his teammates participating in a 5K race. TNT Dental creates a collaborative environment for both its clients and its team members. Alex sees firsthand the success that comes from working with such a strong, open group. He worked his way up through the company, starting as a Designer, then moving to Operations Manager on the Growth Team before coming into his current role. TNT’s open environment inspires team members to do their best work, which ultimately, trickles down to the relationship they build with their clients. Looking to Revamp Your Website to Attract More Patients? Are you looking to spice up your website and find some creative, out-of-the-box ways to captivate your visitors? The production team, led by Alex, would be happy to begin this process with you. Give us a call at TNT Dental today and we can get to work on designing both a new relationship and website with you.